To start with, you need to purchase JioFi 4G device (JMR540 models only) for rupees 700 and Buy JioFi device and upon delivery, obtain a Jio SIM card by visiting any of the Reliance Digital or Jio Store. At the time of Jio SIM activation, please choose JioFi Plan option to get Unlimited Voice and Data worth rupees 1,295 for 8 months, 6 months or 4 months based on the JioFi Plan chosen. Rupees 99 for prime membership will be provided. Additionally get vouchers worth rupees 2,300 in your MyJio account from Paytm, Ajio and Reliance Digital store. True 4G VoLTE speed on any 2G / 3G Smartphones. 4G Data with Video and HD Voice calls. Download speed up to 150 Mbps and upload speed up to 50 Mbps. Long life battery 7 to 8 hours. 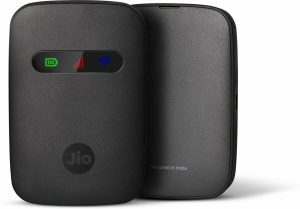 Note:- Customer can buy the JioFi device on official website Jio.com and Customer completing necessary CAF/ eKYC formalities on Reliance Jio Retailer Store or Jio Store.